Welcoming Gregg Rowe to ACCM’s Board of Directors! ACCM is pleased to announce that Gregg Rowe has been elected to our Board of Directors. Gregg has achieved thirty years of experience working in the HIV/AIDS community, and has been a member and volunteer of ACCM since its first days as a grass-roots organization. Gregg Rowe is a native of British Columbia and was diagnosed with HIV in 1987, at the age of 27. He is a professional painter, author and photographer. He is the poster boy of HIV in Quebec (1989) through Comite des personnes attients du VIH (CPAVIH), an organization he co-founded, making history as the first all HIV+ Board of Directors ASO and putting a face to the HIV pandemic throughout Canada. He went on to become the Quebec representative on the Canadian People Living with AIDS Committee Board of Directors and co-founded the first art exhibition for people living with HIV/AIDS “Artists Against AIDS” in 1990. Gregg sat on the Steering Committee to bring The Names Project AIDS Memorial Quilt/La courtepoint l’espoir to the Velodrome in Montreal and was selected to open The Signature Panel at the opening ceremonies. He then did a self-fundraising campaign to raise funds to travel to Washington, DC, with reference letters from MP Andre Boulrice and MP Raymond Blaine, to be the Quebec International Representative at the last International Display of the Quilt in its entity in 1996. On his return from Washington, Gregg co-founded with MP Raymond Blaine the Quebec Chapter of The Names Project. Gregg has been a member and volunteer of ACCM since its first days as a grass-roots organization when it was conceived at an apartment on St. Urbain and was known as MARC-ARMS. He co-wrote the volunteer training program as well as the Buddy Training Manual that is still used today with some changes, just as the pandemic changed to meet our needs. He developed and produced the first anglophone/allophone newsletter in Quebec titled “One Voice” to disseminate HIV/AIDS information to the public. Using his many talents as a writer and artist, he has organized many social and artistic events to fundraise and help break the isolation of his HIV+ friends and collogues and raise awareness about HIV. In 1999, while living on the West Island, he and his significant other opened Mosaic, an organization to raise awareness about palliative care, and addressed “right-to-die” issues with Dr. Belfour Mount from the Royal Victoria Hospital. 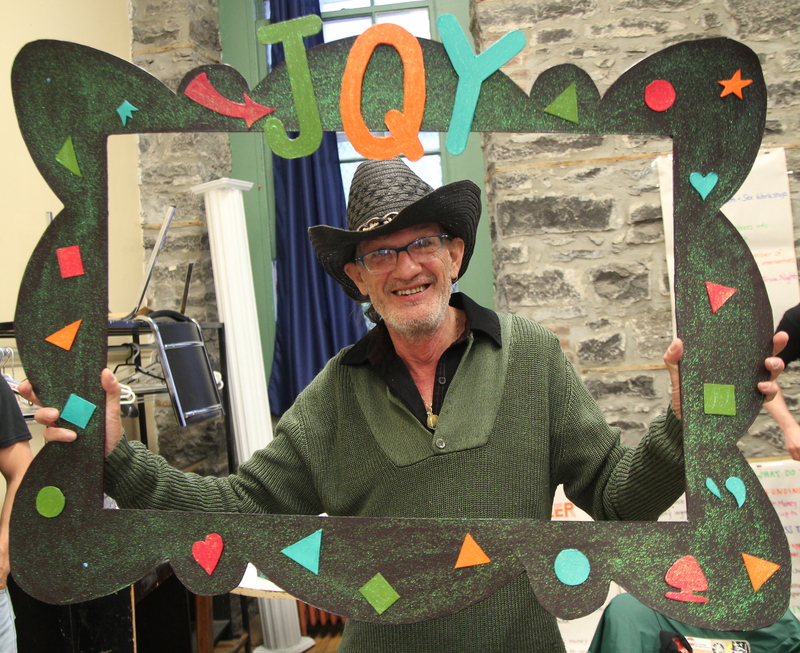 He has been involved with Camp + as volunteer, Camp Representative, and finally Director of Camp when he organized the Country Christmas @ Camp Kinkora three years in a row. He is also a member of ACT-UP Montreal, DiversCite, Gay Pride, and Image/Nation and is active at Concordia University Queer/Sexuality Studies. His current involvement at ACCM includes sitting on the HIV 50+ Aging Committee where he is organizing a weekend workshop on “Grief” in hopes that a support group will be composed for those grieving the loss of a “soulmate”, after losing his partner of 32 years. He is currently co-organizer of Zone +, an International Art Hive where his passions come alive, bringing art workshops to those affected and infected by HIV together to help bring them out of isolation and to give them support amongst their peers. He is a firm believer that art is healing and is a useful tool in releasing stress that often surrounds the many issues living with HIV/HepC. Gregg has held seats on numerous committees, ad-hoc committees, and Board of Directors locally, provincially and nationally and has represented Quebec at International Conferences. He has achieved thirty years of experience working in the HIV/AIDS community, learned a lot of lessons, met a mosaic of people, shown his gregarious and resilient sides, devoted his life as a volunteer and was able to have a voice in community decisions. He wishes to continue to be a part of this journey in making positive changes and having a voice for those infected and affected by HIV/HepC.